A reality-based recruiting, screening and training solution. Weld operators benefit from both weld simulations and the incomparable real-world experience of live arc welding. In both modes, LiveArc provides instant, valuable feedback on welding technique to quickly help build skills. Measures the operator’s adherence to pre-set technique parameters using advanced motion-tracking technology. Cameras track the movement of LEDs embedded in the MIG SmartGun and SMAW SmartStinger; the system then delivers visual feedback on the operator’s performance via the LiveArc system’s main display. The 400-amp SmartGun is compatible with Miller power sources and can be used for non arc weld simulations as well as live-arc weld training. A built-in OLED display provides initial visual feedback to guide proper gun positioning. On-gun pushbuttons make navigating weld exercises fast and easy. The SmartGun also offers tactile vibration feedback on a selected weld parameter that helps guide real-time performance adjustments. Guided by an easy-to-understand interface with graphical icons and instructional pop-ups, users find navigation intuitive with a quick learning curve. The system offers easy selection of assignments and review of Welding Procedure Specifications (WPS), including proper material selection and preparation, correct power source and wire feeder settings and target welding technique parameter values. After completion of an assignment, the interface delivers detailed feedback on the operator’s technique. Assignments can be quickly configured and customized with target values and limits for technique parameters. Data is captured so individual weld operator’s performance can be stored, retrieved and reviewed at any time to monitor ongoing development. Allows completion of out-of-position welding exercises, with calibration, motion tracking and feedback occurring in the same way as table top exercises. Built to withstand heavy use, the LiveArc system includes a widescreen HD monitor and powerful industrial computer with solid-state technology and filterless, fanless cooling. The rugged ArcStation base features a 1/2-inch reversible steel table that allows flexible coupon placement; it ships complete with drawers, gun holder, quick-release clamps and heavy-duty casters for mobility. The Miller LiveArc system gives weld operators a superior training experience, delivering immediate, objective feedback in both simulations and live arc welding. 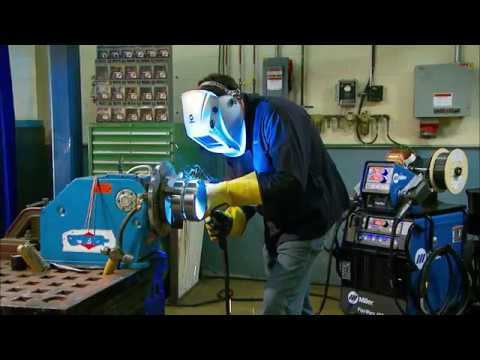 Intuitive and easy to use with minimal supervision, LiveArc gets operators welding faster while saving money on supplies, helping instructors deliver more-effective and efficient lessons, and offering the peace of mind of the Miller True Blue Warranty. There are welding technologies and solutions that can help companies find and train skilled welders faster — and make it easier for welders to complete high-quality welds once they are on the job. ALMACO chose to implement LiveArc™ welding performance system into its operations as a training tool.